This page outlines information about the Victorian Commission for Gambling and Liquor Regulation (VCGLR) Commission hearings, decisions and inquiries. The VCGLR is an independent decision-making authority. 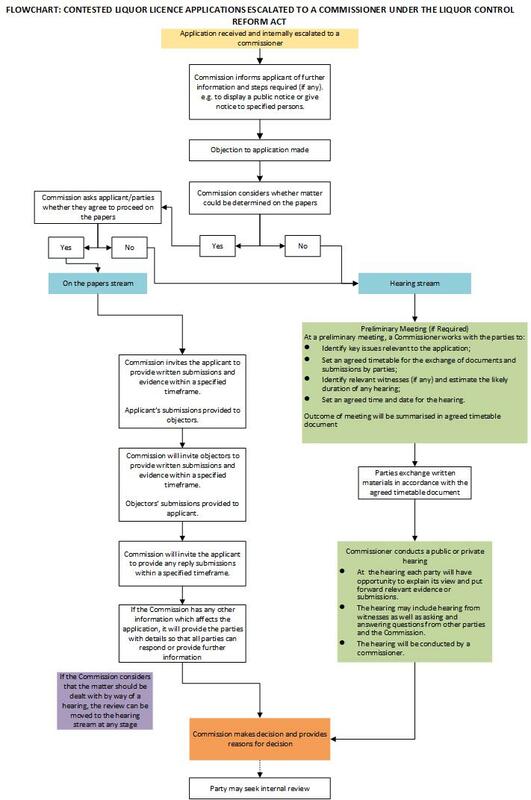 The objectives of the Commission based decision-making structure is to deliver balanced and consistent regulatory decision-making for liquor and gambling matters. The VCGLR is accountable to the Minister for Consumer Affairs, Gaming and Liquor Regulation and Parliament. To view and download previous decisions and reasons for decisions in relation to gaming applications and disciplinary action proceedings visit the Gambling commission decisions and Liquor commission decisions pages. For searchable decisions, see the austlii website . disciplinary actions and on reviews of decisions made by a single-commissioner or delegate of the Commission. The Commission must also publish a notice advising of the upcoming public inquiries on this website. A person whose interests are affected by a decision of the VCGLR may appeal to the Victorian Civil and Administrative Tribunal or the Supreme Court on a question of law. The appeal body will be determined by the nature of the decision. Liquor licensing applicants and objectors have the right to ask for an internal review of a licensing decision if a single Commissioner or delegate of the Commission made the decision. Any reviews are heard by a panel of Commissioners. To ensure the independence of the review, the panel of Commissioners must exclude the original decision-maker. Hearings are usually conducted in a public forum (unless confidentiality considerations apply). The Commission provides a written statement of reasons of its internal review decision to the applicant. Parties to an application are given written notice of the inquiry. Information about upcoming hearings or inquiries is also available on this page. The VCGLR ensures the internal review is fair by providing appropriate written notice to applicants, excluding the original decision-maker from the review and holding the review publicly (where possible) to promote openness and transparency. The VCGLR provides a written statement of reasons of its internal review decision to the applicant. 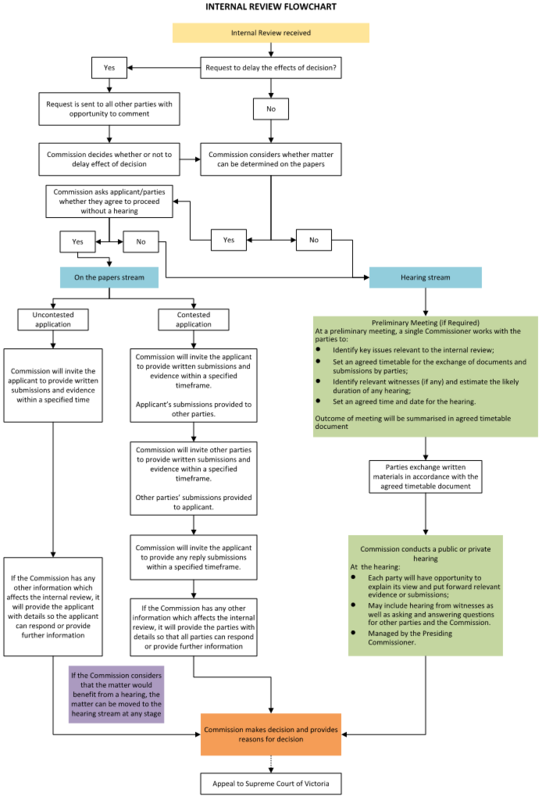 Internal review flowchart (PNG, 131.81 KB). As Practice Notes/Information Sheets are either amended or developed over time, they will be published on this page. In this section, you will find the dates and agendas for forthcoming gambling meetings, inquiries and hearings of the Victorian Commission for Gambling and Liquor Regulation (the Commission) and the published decisions relating to previous meetings on gambling matters. Results of public inquiries and hearings conducted by the Commission are also available, as is information on appeals. The following table lists all current applications to the Commission for approval of premises as suitable for gaming or to increase the number of gaming machines at an existing approved venue. List of upcoming gambling inquiries and hearings. The following decisions arise from inquiries and hearings of the Commission on gambling matters. List of gambling matters determined. Appeals to the Victorian Civil and Administrative Tribunal (VCAT) and Supreme Court, Court of Appeal (SCCA) against decisions made by the Commission on gambling matters are available via the Australasian Legal Information Institute database (search 'Gambling' to find relevant decisions). Archived agendas from public session Commission meetings are available to download at Archived public meeting agendas - 2012 (PDF, 93.97 KB). In this section, you will find the liquor hearing guidelines, dates for upcoming hearings and published inquiry notices. Inquiry notices are published pursuant to Section 92A and Section 94B of the Liquor Control Reform Act 1998. The inquiry notices detail the initial hearing date and grounds for the inquiry. Dates and details for upcoming liquor hearings pursuant to the Liquor Control Reform Act 1998 are available below. Commission proceedings are usually recorded and produced in a written transcript. The current provider of recording and transcription services to the VCGLR is Auscript Australasia Pty Limited. The parties to the proceedings may request a copy of a transcript. The Commission also provides, on the conclusion of an EGM matter, a copy of transcript to the Victorian Responsible Gambling Foundation for research purposes. Copyright of the transcripts is owned by the Commission. Transcripts cannot be photocopied or used in any other way without permission from the Commission. 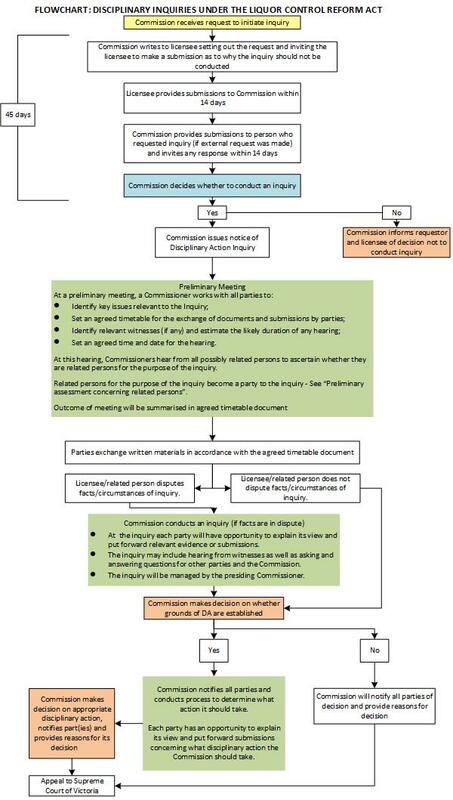 Commission records of proceedings, including transcripts and audio recordings, are retained by the Commission for two to three years after the completion of the matter. After the retention period has expired, the original transcripts are sent to archives for safekeeping.